The temple bells toll in the distance: a distinct, metallic clang of bronze. “What a trendy bikini,” I think, as two girls walk past, suddenly rendering my swimsuit woefully out-of-fashion. Nearing sunset, the sea now resembles molten lava. I hear a yoga mat being dusted. I look up to see its owner - a middle-aged Caucasian with long, shocking-white hair and beard, tanned like a carrot from the sun, sporting rudraksha beads and aviators – done with his yoga for the day. My mobile rings: my auto driver says he’s waiting for me at the top of the hillock. If I want to see the evening aarti, I’d need to leave right away. I polish off the last slice of my Hawaiian pizza and gulp down my drink. Half an hour later, I join a snaking queue outside the crowded Mahabaleshwara temple. The heady fragrance of jasmine fills the air, occasionally mixed with the stench of cow dung, as cows sporadically relieve themselves. The bells toll even louder now, and people fold their hands in devotion, chanting prayers, occasionally crying out the lord’s name. Suddenly, the queue begins to frantically compress and shove; the door to the sanctum has just been opened. A cow ponders worldly matters at Om beach, un-distracted by revellers. 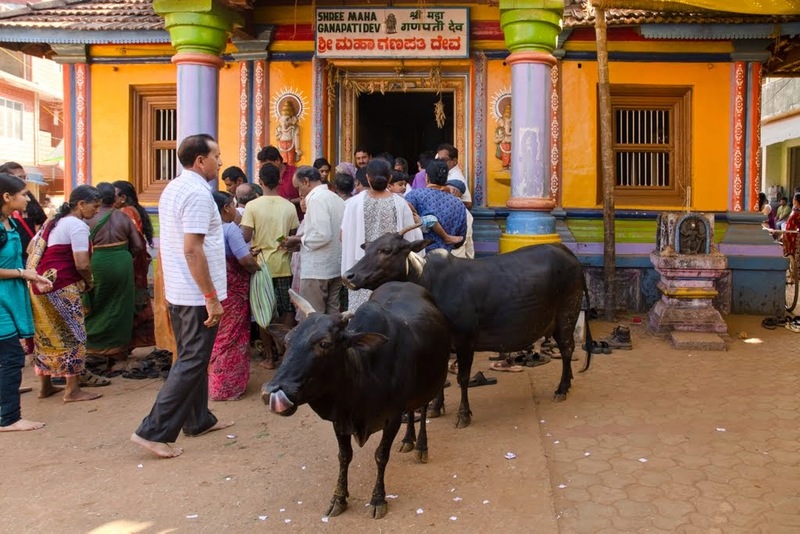 The name Gokarna means ‘cow’s ear’ and has a mythological story to back it. One of Gokarna's quirky residents. A couple of days ago, driving into Gokarna, the highway gradually narrowed until my car got stuck trying to enter a crowded, one-car-width road. As I inched ahead, panic-stricken, the human tide parted to make way, squeezing between my car and open gutters on either side of the road. I was afraid somebody would fall in or that another vehicle would come along. The road did slightly widen after a while. Another vehicle did drive past. Gutters continued lining the road. The swarm of people remained. Yet, we all squeezed in to fit into that road. 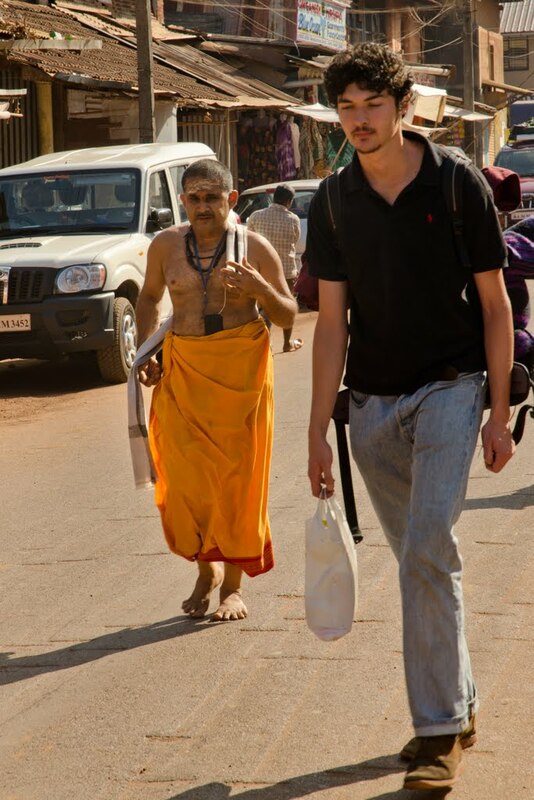 That’s what Gokarna is all about – coexistence. By the time I drove on, took an incredibly difficult turn into an even narrower road to my guest-house, slipped on omnipresent cow dung and almost fell into a gutter, I was ready to leave. I only stayed because I was too scared to drive out again. Yet here I was, walking a couple of days later, seasonedly squeezing myself between a car and the dreaded gutter, making way for somebody else’s arrival into Gokarna. 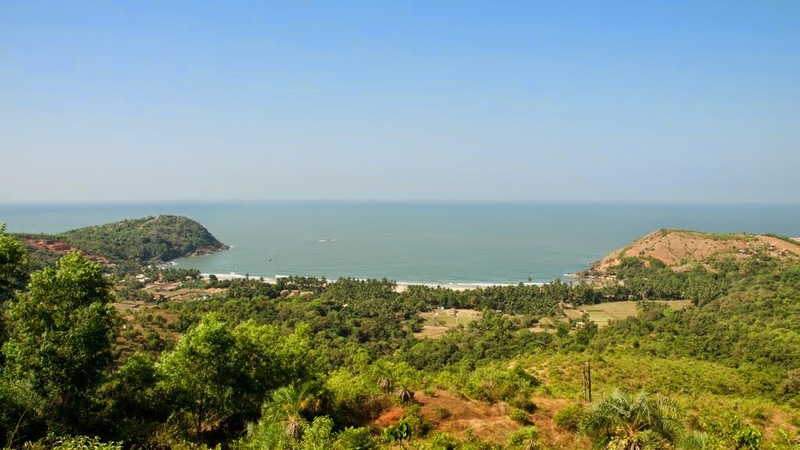 If Gokarna were a person, it would’ve been dubbed schizophrenic; it has two facets – a pilgrimage centre drawing hordes of devotees, and beaches attracting equal droves of flower-children. 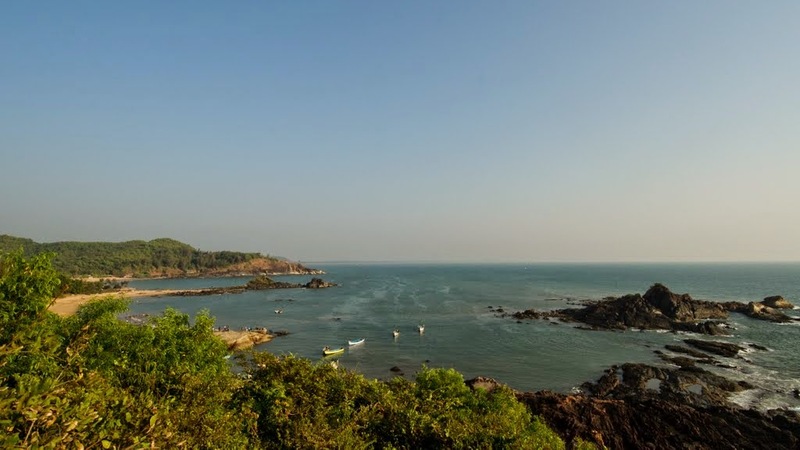 The former is called Gokarna Town while the beaches are simply known as Gokarna. 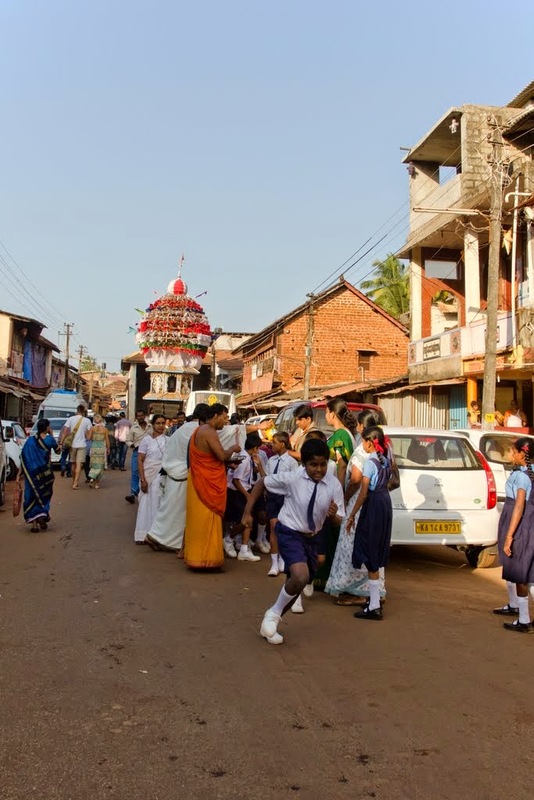 The town was a bastion of orthodox Brahmins, until it began attracting hordes of non-Indian visitors seeking spirituality, yoga, meditation, and its many virgin beaches. 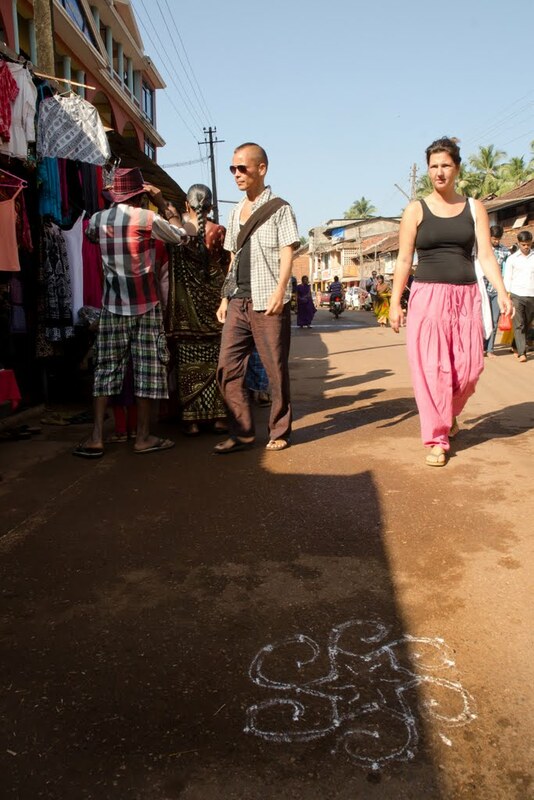 Today, almost half the people seen in Gokarna are foreigners. For most visitors, their holiday begins and ends at the beaches. Most pilgrims confine themselves to the temple town. Both are neatly separated by a series of hillocks. 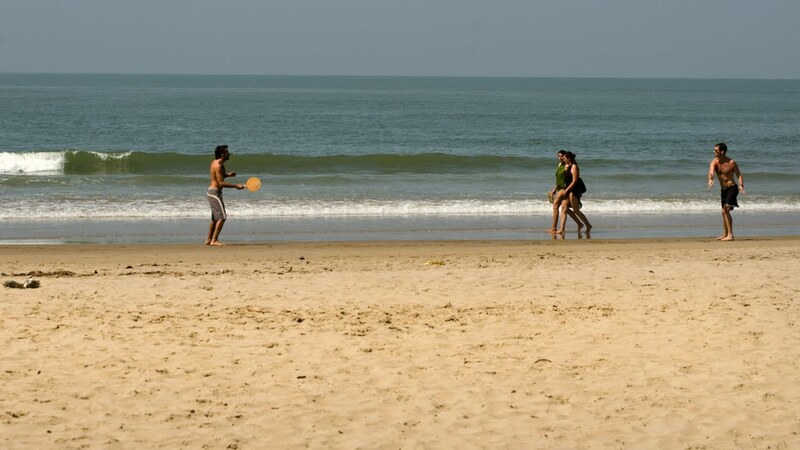 Only one beach straddles that gap: Gokarna beach. Accessible by a short walk from the temple, this is where pilgrims unwind at the end of their temple visit; the women bashfully dip their toes in the water, while the men and children let loose. 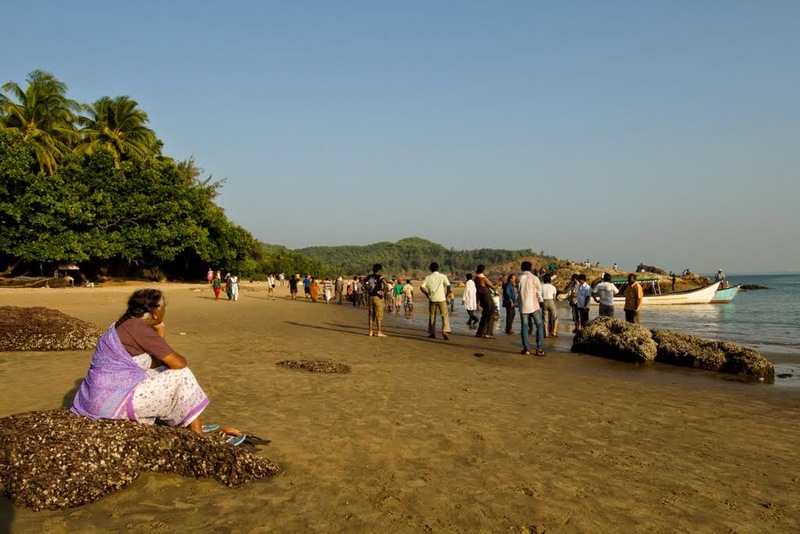 This beach is also where rituals for last rites are performed; Gokarna, aka Dakshin Kashi, is considered one of India’s seven holiest ‘places of salvation’. On the very same beach, you sometimes find beach bums who have strayed a bit too far from neighbouring Kudle beach, a part of the ‘beach Gokarna’ side. I, in fact, was attempting to straddle the divide in my own way: I’d chosen to stay in the town and visit the beaches from there. 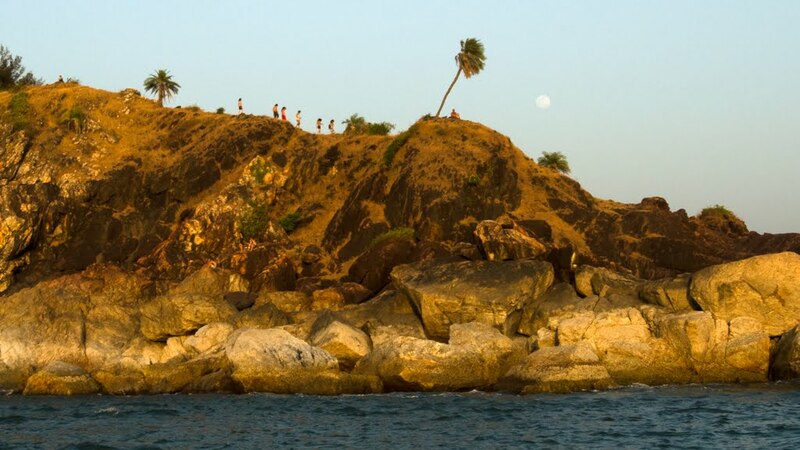 Beach-bums walk the rocky promontory from Om beach to Half-moon beach, even as a person meditates under a coconut tree at sunset. Om Beach is popular with locals and visitors alike. And, with bovines too. Very little gives away the fact that Kudle beach is located in a temple town: tourists sun-bathe, play frescobol, canoe, swim in the clean, blue waters, or idle in one of the many shacks. Om Beach on the other hand, is popular with pilgrims too, attracted by its shape – an inverted Om - a religious symbol. This lends it an air of virtuous fun, preferred by families trying to avoid the possible culture-shock at Kudle beach. Boats moored here ferry people to Paradise and Half-moon beaches, whose camps and wild parties, disallowed nowadays, make Om and Kudle beaches seem tame in comparison. Tourists play 'frescobol', a Brazilian beach game akin to table-tennis, on Kudle Beach. Om beach is most crowded in the evenings, when the glorious light tinges everything orange. 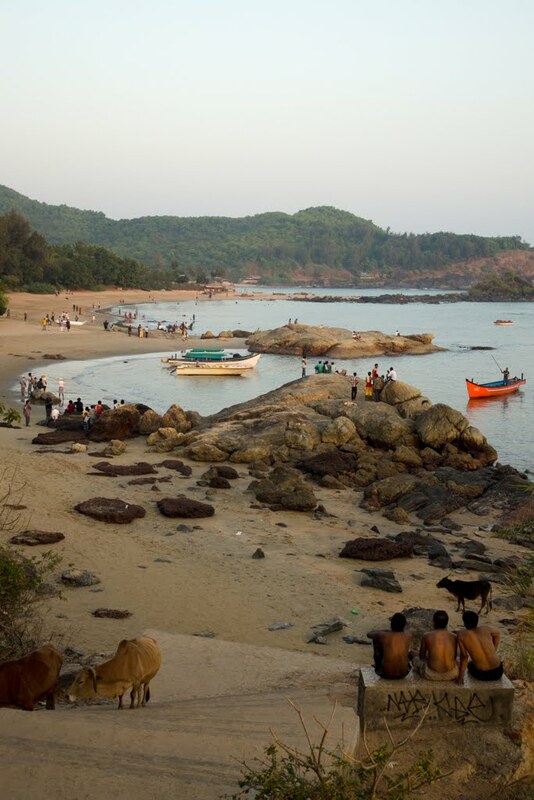 If the beaches exude a relaxed vibe, Gokarna Town is their antithesis. It buzzes feverishly from as early as 4 am, well into the night. 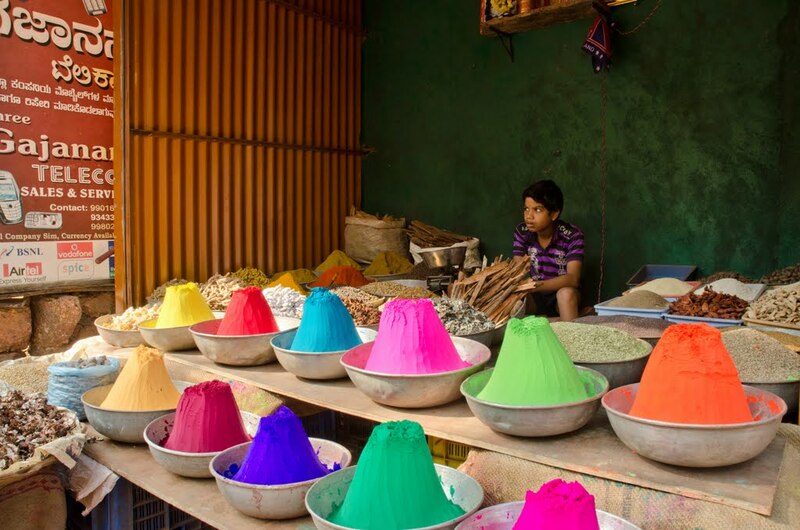 All activity centers around narrow, winding 'Car Street'; homes jostle for space with tiny shops selling musical instruments, trinkets, sarongs or yoga essentials. Graffiti and street art co-exist with the colourful local architecture. 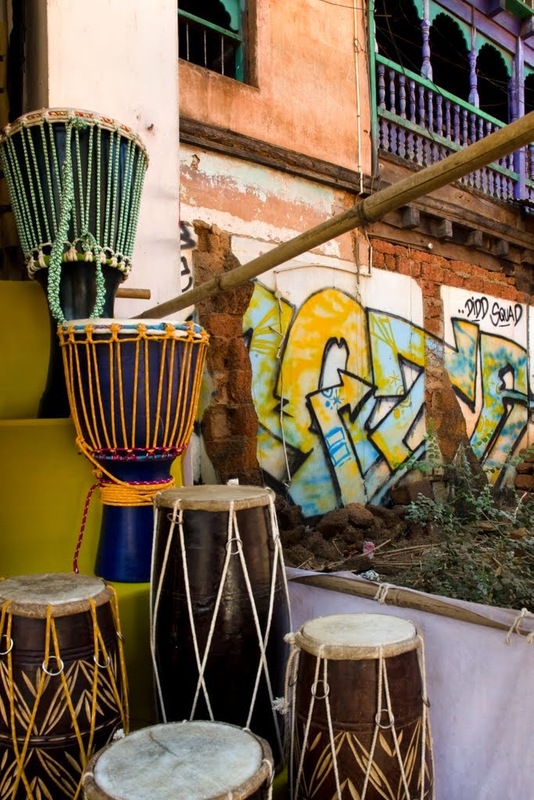 Car Street’s surprisingly bohemian flavour is much like Goa in the 1970s, though it progressively wanes towards the end where Mahabaleshwara and Maha Ganapati temples become the street’s focal points. The former temple is dedicated to Lord Shiva, seen here in the form of an atmalinga (a piece of Shiva’s soul). The latter, to Shiva’s son Ganesh, who is said to have deceived Ravana and prevented him from fleeing with the atmalinga. The boy-Ganesh statue here is unique, in that it is two-armed and in a standing posture. The temple chariot sits not unlike a UFO, in between cars and minivans from which hundreds of pilgrims emanate, to seek blessings at both temples. 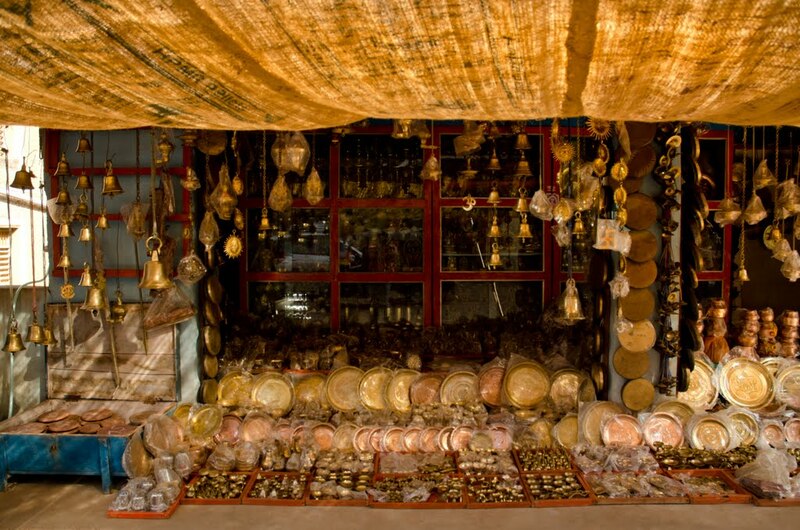 Shops selling swimwear, spaghetti tops or bongos, strangely congruous amidst shiny brass-ware and devotional paraphernalia, lure you along Car Street. As you gingerly step around a painstakingly-drawn rangoli outside the swimsuit shop, it reiterates why though reminiscent of Goa, Gokarna can never become Goa’s replica; the temples ensure that. Some locals do speak of resentment setting in, at their town degenerating due to immorality. In general, however, there is a nonchalant acceptance of foreign visitors, most of whom are mindful of not hurting local sentiments, and attempt to blend in. In fact, some seem more local than locals themselves. 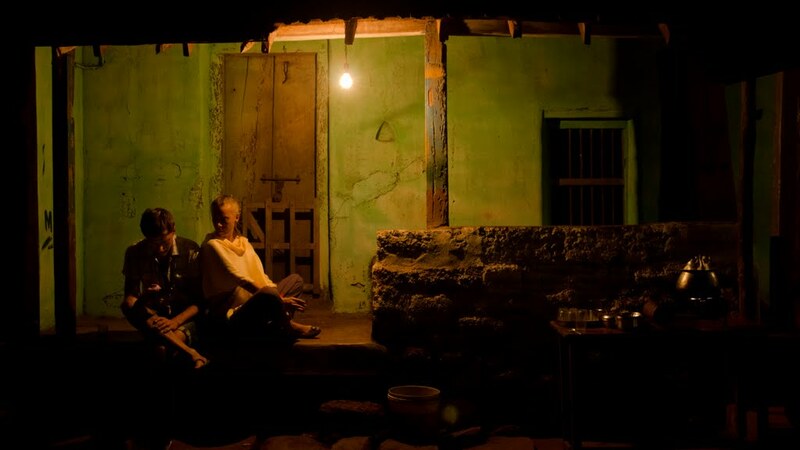 Under the cover of darkness, Gokarna Town morphs into a laid-back twin of its daytime avatar. Most locals head home, while pilgrims vanish. Blackened aluminium kettles bubble away on tea-carts, supplying everybody’s favourite evening glassful. Sudha’s, which not only stocks books in a plethora of global languages but also offers to ship them to you should your backpack be full, becomes a hotbed of discussion. 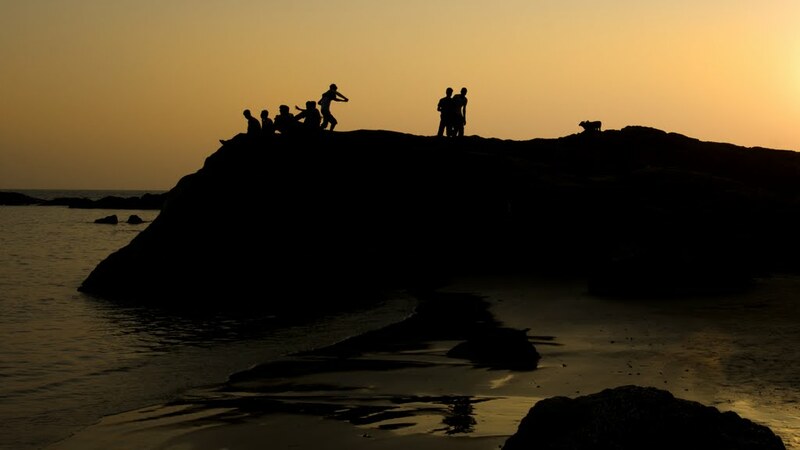 In the multi-hued, dim lighting Gokarna seems to favour, the vagaries of that afro hairstyle, the Om tattoo, or that tongue piercing make for a people-watchers’ paradise. 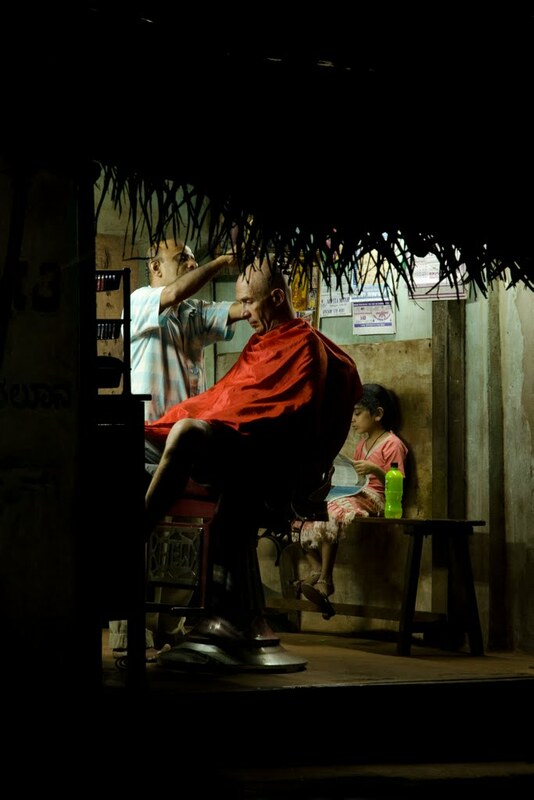 An old, Indian-style barber shop has a foreign visitor. The unintentional saffron colour of the cloak reminds you of Gokarna's status as a temple town. 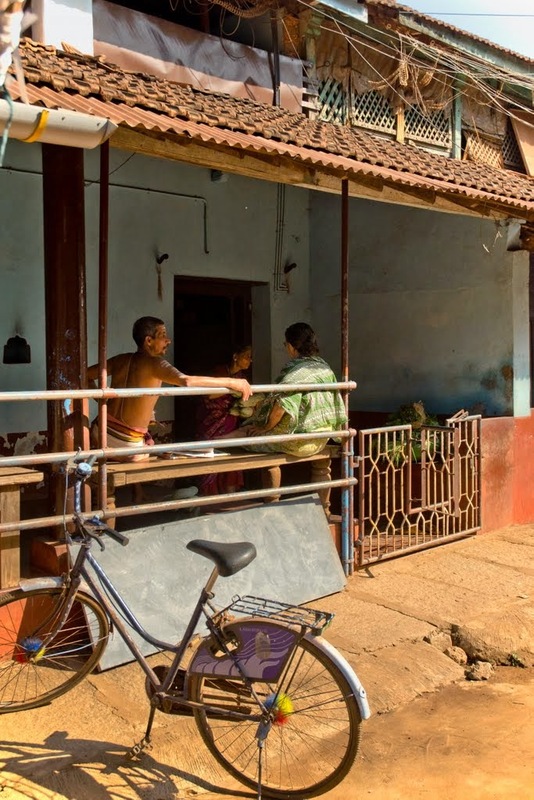 All this makes the photograph redolent of Gokarna's duality. Enjoying hot tea by the roadside. My last morning in Gokarna, I awaken much before the sun does, have a 5 am breakfast, and don’t find any of it odd; Gokarna has effortlessly sucked me into its routine. Dolphin-watching hadn’t been fruitful the evening before, so I’ve decided to try again. Did I forget to mention it? Amongst all the things Gokarna offers, glimpses of curious beaks, slender fins and flexible torsos are a given; if you are lucky, acrobatic breaches from the water too. 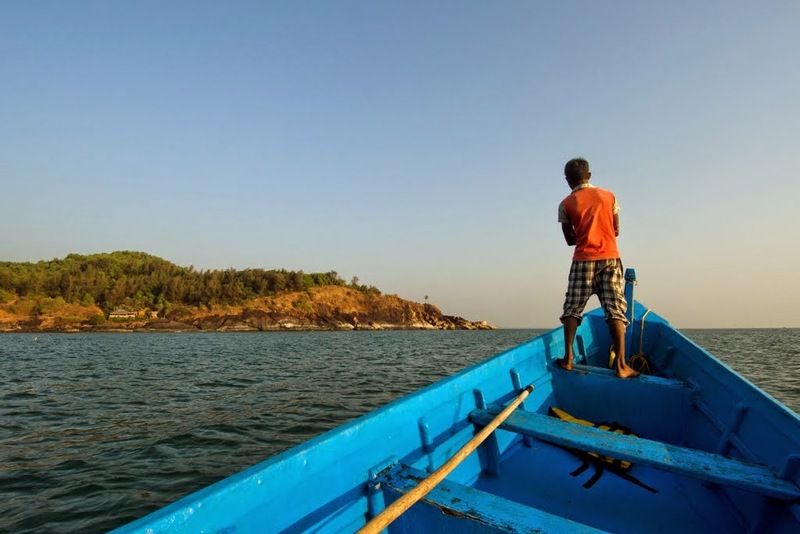 Boats are available from Om and Kudle beaches, and boats-men double up as guides on hour-long trips. As our boat returns towards Kudle beach, we are surrounded by shoals of tiny, silver-coloured fish, jumping in sync with the boat. While photographing them, I hear the bells toll, a reminder of where I am - not on a beach holiday, but at a temple town. Ahead lies pristine Kudle beach, where shacks are just beginning to open for the day. A few early-swimmers’ heads bob alongside us. So am I not on a beach holiday? Or, is it a temple holiday? I seem to be constantly flitting between the two, my memories from both intertwining to form a crazy, unconventional holiday memory. I smile as I alight - I’d never know. Brilliant post. I can relate to your story as I was there myself on my solo Karnataka exploration bike ride. Some rides are so scenic there, right?! Thanks, Jatin. You are absolutely right! The rides are very scenic, with varied landscapes. This road-trip was by car; hoping to bike someday.